전에 마라톤을 완주 해 본 적이 있어? 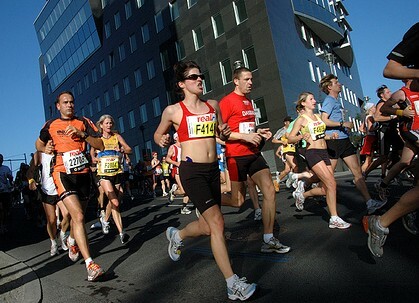 Have you run a full marathon before? 전에 한국 김치를 먹어 본 적이 있어? Have you tried Korean Kimchi before? 전에 해외 여행 해 본 적이 있어? 전에 조운즈 양을 만나 본 적이 있어? Have you met Miss Jones before? 전에 춤추러 가 본 적이 있어? Have you gone dancing before? 전에 오토바이를 타 본 적이 있어? Have you ridden a motorcycle before? 전에 별똥별 본 적이 있어? Have you seen a shooting star before? 이전에 뼈 부러진 적이 있어? Have you broken a bone before? A: Have you run a full marathon before? 이전에 마라톤을 완주해 본 적이 있어? B: I tried, but I got lost. 시도는 해보았는데, 중간에 떨어져 나갔지. A: Have you met Miss Jones before? B: I haven’t had the pleasure. 그런 기쁨을 아직까지는 경험하지 못했어. A: Have you ridden a motorcycle before? 이전에 오토바이를 타 본 적이 있어? B: I haven’t learned how. 어떻게 타는지 배운 적 없어.